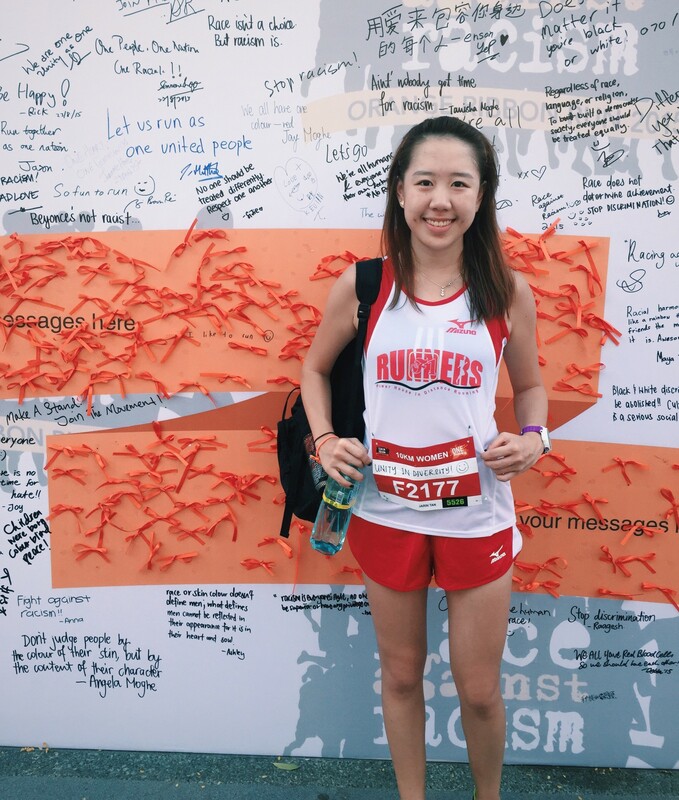 Race Review: Orange Ribbon Run 2015 [10 km] (by 'Ah Girl') | JustRunLah! 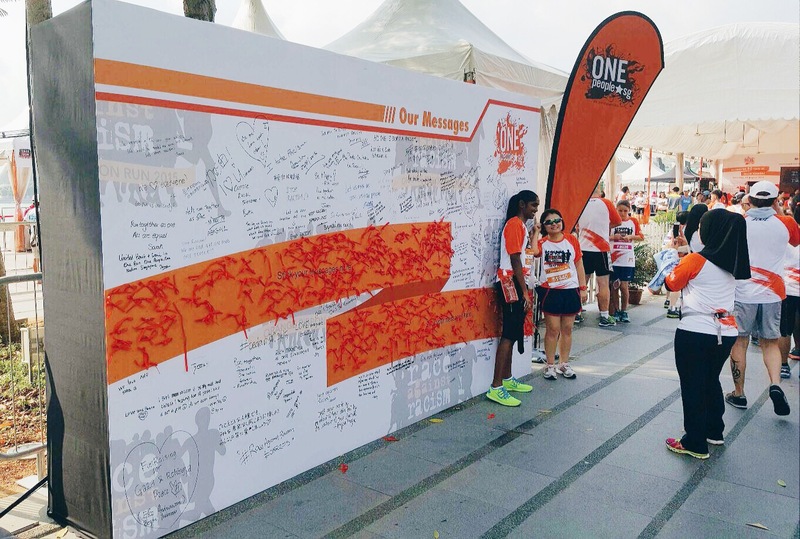 OnePeople.sg’s Orange Ribbon Celebrations aims to rally the community in one voice and make a stand against racism. 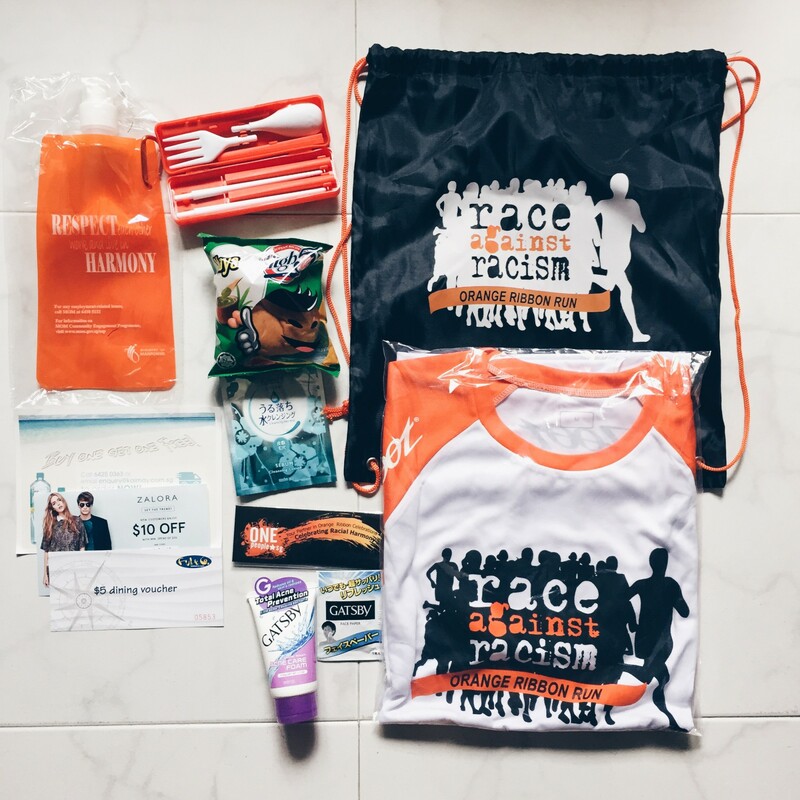 The Orange Ribbon Run is their signature event where people of all races gather and have fun through running, thereby promoting the values of friendship, mutual understanding and racial and religious harmony. Being Singaporeans, we have seen how important it is have a society where everyone respects and receives equal rights regardless of their race or religious beliefs. I reached the Velocity early and so there were not much of a queue and race pack collection was done smoothly. 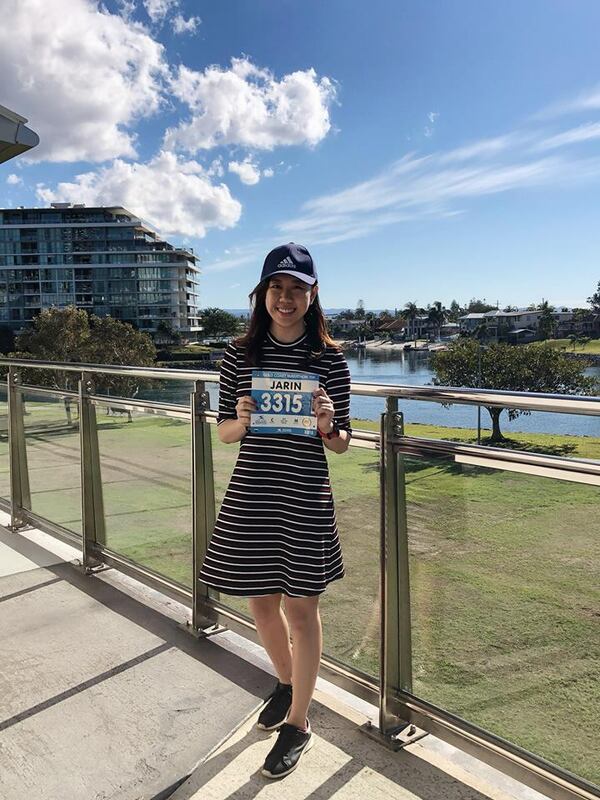 The staff were friendly and made sure that the tracking device on your bib is working by asking you to check against the TV screen for your name and bib number as the device was being scanned. The portable cutlery set has got to be the most interesting item yet! 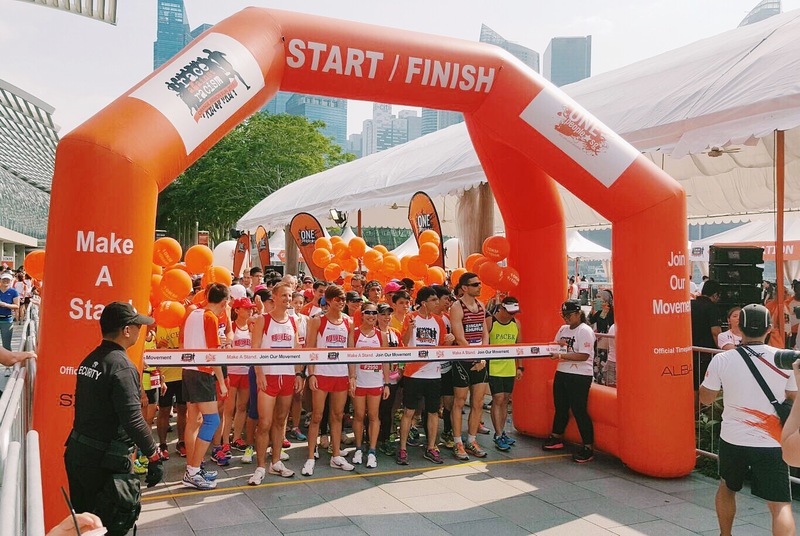 The flag-off timing for 10km was at 4pm and I felt that it was an unfavorable time since the sun was still out on full blast and the recent haze situation made it worse. I was already dripping with sweat even before the race started and being a night run/early morning run person, I knew this race is going to be a tough one for me. Perhaps next year they could choose either a morning or late evening flag-off timing because there were multiple cases of heatstroke. 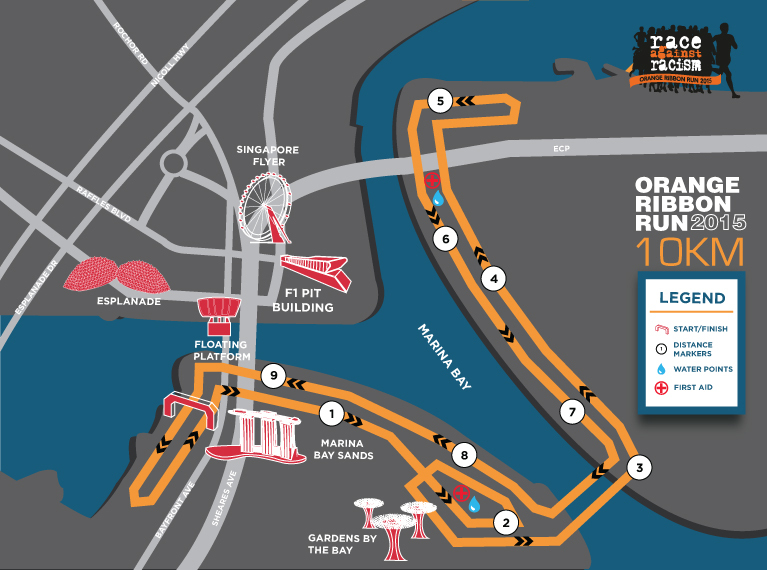 The 10km race route mainly includes multiple scenic attractions of Marina Bay such as the Marina Bay Sands, Gardens By the Bay, Marina Barrage and Singapore Flyer. I started off my 1st km with a pretty decent pace of 4:10 despite tripping and almost falling as a runner with super long strides went diagonally across my path. The 2km mark was when my pace started going downhill as we advanced upwards the Marina Barrage. It felt as if half of my energy had been drained in addition to constant dehydration from the heat. The path upwards was rather narrow as well but runners were rather considerate in sticking to one side. As I proceeded with the following distances, effects of the heat just kicked in on and off; from occasional headaches to constant eye irritation from sweat dripping from my forehead, to muscle cramps. I had no choice but to stop twice and walk, hop for a few steps and tried my best to complete the race. Distance markers were well-marked and the race route was moderately flat after the 2km mark. The last 1km towards the finishing line was slightly confusing because there were some small zig-zag stairs and the ending point was further than I thought. Hydration stations were visible and drinks in the form of pH alkaline water were served in paper cups but they were not chilled. Or perhaps they were but the heat just made it warm? Well, it would be nice if they had isotonic drinks that could provide some form of electrolyte source for the super dehydrated and drained participants. I am not sure who else experienced this but the baggage collection took longer than usual and the deposit area was quite chaotic and in a mess. Participants were getting impatient as they were tired and exhausted from the race and heat, while volunteers were at lost and frantic in trying to attend to everyone’s requests. Hopefully the volunteers can act more efficiently and organize the baggage in a way that is easier to search for in the next year’s race. In any case, I still appreciate the volunteers’ time and assistance put into this event. I seldom run in the sun as I am only able to train for runs after work or early in the morning. 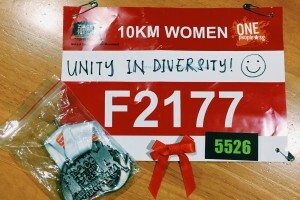 As such, this was a pretty challenging race and though I didn’t manage to do exceptionally well, I am still glad that I pushed myself to complete it anyway! Congratulations to all podium finishers and participants in this meaningful race. 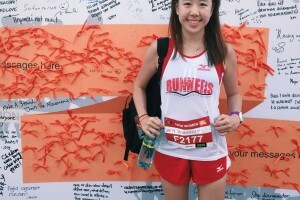 It was full of runners from all ethnicity, culture and nationalities! The weather is an element that is not within the control of any race organiser and the only thing they can do is to either improve the welfare on race day to ease and prevent heatstroke or related physical effects of heat, or to completely change the race flag-off timing for future race events to minimize such cases. 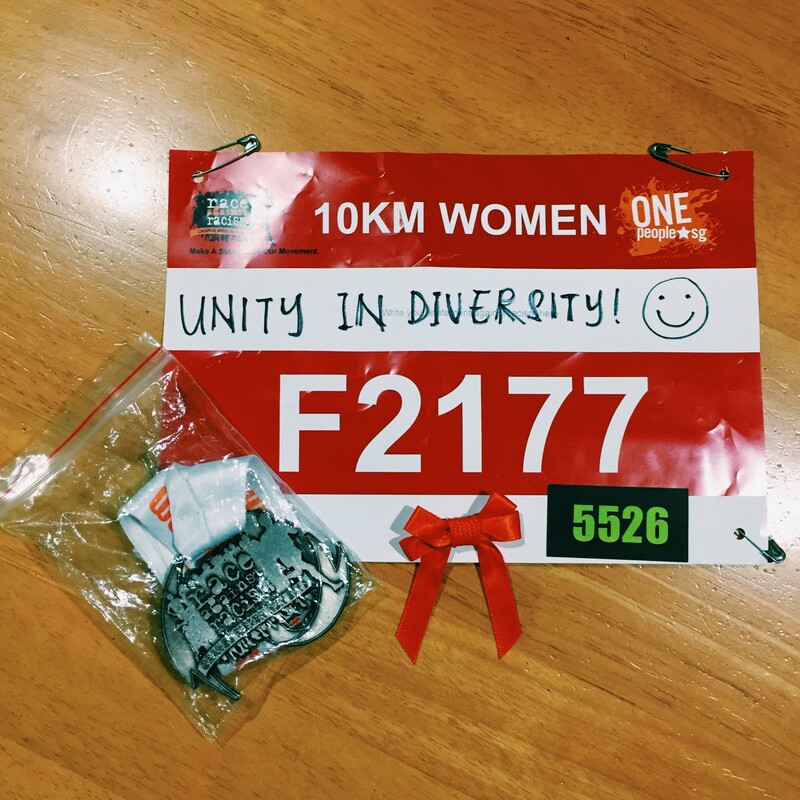 Nonetheless, it was a heartening sight and experience to run alongside with people from all races and backgrounds and the post-race expo was quite fun as well, with cultural performances and activities. Hope everyone had a good time and well done for conquering yet another race in Singapore’s running calendar! A good writeup. Yes I agree with you that the weather was super hot yesterday. Also I had to wait for more than half an hour at the baggage collection station. I hope the organizer will improve the arrangement for next year event.